Battle between Rome and her neighbours was a frequent phenomenon in the ancient world as Rome rose to power and prominence. More frequently than not, Livy ascribes Roman victories to Roman virtu- whether of the commanders or of the soldiers- but that was not always so. Livy was more realistic an analyst and better a historian than to believe that all of Rome's triumphs might be explained by its virtues. In a battle between the Hernici and the Romans in 362BC, Livy mentions not merely that the Romans armed themselves both with valour and with their best men, but suggests that the Hernici too were able to call up large numbers of men and also their best men. The rank and file of the armies clashed but it was on the Homeric strength of their most illustrious detachments that the fortune of battle depended upon. These factions were Livy acknowledges equal: 'nothing could have stopped' the Romans, save for 'the special cohorts' of the Hernici, he tells us (VII 8). 'What it was that tipped the balance between two such forces so evenly matched is difficult to say, unless the invariable fortune of the two peoples had the power to raise or diminish their fighting spirits.' There is an indication here that the Romans may have profitted from their history of victory- and yet it is only an indication, a hint which suggests a reason the Romans might have won. But Livy finds it difficult to say quite why Rome won- save for its mystical destiny to win, save for the fact that ultimately it did win. Within Livy's pattern, this is inconsequential- it does not contradict his picture- but it offers an indication that Livy like most historians knew that there was more in history than there was in the patterns with which he constrained and explained it. The Romans were united, their enemy had kin, kith and sister cities taking no part of their cause. 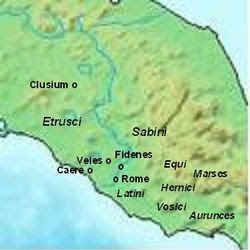 It is asking too much of a Roman historian, for a blueprint for successful resistance to Rome, in an 'enemy' so close. Rome was a puppy, that out-fought its own den. Obviously Cadiz Rome had structural advantages- but I think what is interesting about this passage is that Livy admits that this particular victory was difficult to explain. I'm just making the sceptical point that historical explanations can not explain everything that you see- and that Livy understands the elemeent of the contingent in history.